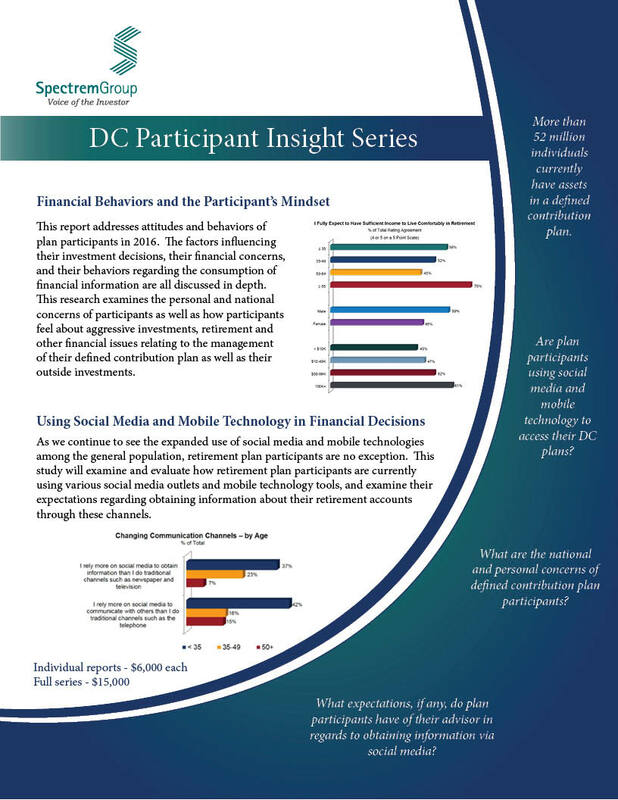 The DC Participant Insight Series includes research conducted with approximately 2,000 plan participants and are 50-60 page-long reports with information segmented by participant age, gender, and account balance. $6,000 each or $15,000 for full series. This study addresses the attitudes and behaviors of plan participants in 2016. The factors influencing their investment decisions, their financial concerns, and their behaviors regarding the consumption of financial information. This understanding will allow financial services firms to better position themselves to calm investor's concerns and increase satisfaction and confidence among plan participants. The study examines how participant feel about debt, aggressive investments and other factors relating to management of their defined contribution plan as well as their outside investments. As we continue to see the expanded use of social media and mobile technologies among the general population, retirement plan participants are no exception. This research will examine and evaluate how retirement plan participants are currently use various social media outlets and mobile technology tools, and trending analysis will be done versus last year's research on these issues. We will observe how these participants have continues to integrate these tools into their financial, investment, and retirement planning activities. Research shows that there are a multitude of driving factors regarding advisor usage among the general population, including age, wealth level, occupation and gender; but what about advisor usage among retirement plan participants? What factors affect the way they utilize the expertise an planning skill of financial advisors? Who are they most likely to turn to for advice? Are the advisors they use associated with their retirement plan, or do they use an outside advisor? if so, what type of advisors do they use? What reasons were involved in making these decisions/ What services have they received from an advisor? What do they need? Financial planning? Long-term care?